NOTE ~This giveaway sponsored by WamBams corner and Collage.com. At Collage.com you can turn your memories into a masterpiece!! With Christmas right around the corner,we are all looking for that very special gift wrap. The one that defines who we are. When Collage.com contacted me to review there wrapping paper, I immediately said YES. I didn't think twice. I ordered my Gift wrap ,11x14 ornament , and a 6ft roll of wrapping paper, which you can add from 20 to 200 photos online, and it is very easy to do. It arrived 2 days after I put my order in! It also gives you great choices of where you can go to upload your pics. I feel that with this gift wrap you make a statement before your family even open their gift. Whether it’s a picture from your first date for that important anniversary; embarrassing baby photos for your kid’s 16th birthday or just a montage of adorable pictures of your puppy, their custom wrapping paper is a great way to make your gift fun and memorable. I have ordered the Photo Books from Collage.com and the pictures were amazing! I thought that if they were on wrapping paper , they would look weird , I was very shocked to find out that the quality is the best! The pictures grabbed my attention, the one of my sister which is kind of old looks even better than the one I have on my computer! Here is a pic of what it looks like when it arrives. And here is her masterpiece!! The picture on my gift wrap looked so perfect!! The Ornament come in 2 shapes , oval or rectangle. I chose oval with the picture of my sister whom, passed away 10 yrs. ago. The picture looks so good , I love it! I also ordered my Aluminum 11x14! All, this pictures were through out the year! Now what better way, to end the year, than with awesome memories! I have to admit, the pictures look even better than how I have them stored!! I have not, wrapped my gifts yet.. but as soon as I do, I will post on here so you can see what my Collage.com Gift Wrap looks like under the tree!! At Collage.com they don't only have gift wrap they have so much more, like Ornaments,Photo Books, Canvases, Cards, Posters, Calenders, Canvas Posters, Bamboo Prints, Aluminum Prints, Pillows, Beach Towels,Shower Curtains, Tote Bags, Canvas Panels, Cases, Mugs, Mouse pads and Blankets!! 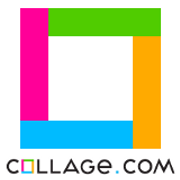 Head on over to Collage.com and see for yourself! And thanks to Collage.com they have kindly offered to give my reader a 11x14 Aluminum canvas, Gift Wrap, and a photo ornamen, to make your gifts bring out the character in you! The winner will be announced on Dec. 15, 2014 and will have 48hrs to respond to the email or a new winner will be chosen! Disclosure: I received the above items for review. I was not conpensated for this review. WamBam's Corner only recommends products that I feel are of benefit to my readers.